Located in the city centre on top of a leading mall in Banjarmasin, surrounded by business and leisure spots and only 25 Mins from Syamsudin Noor Airport. 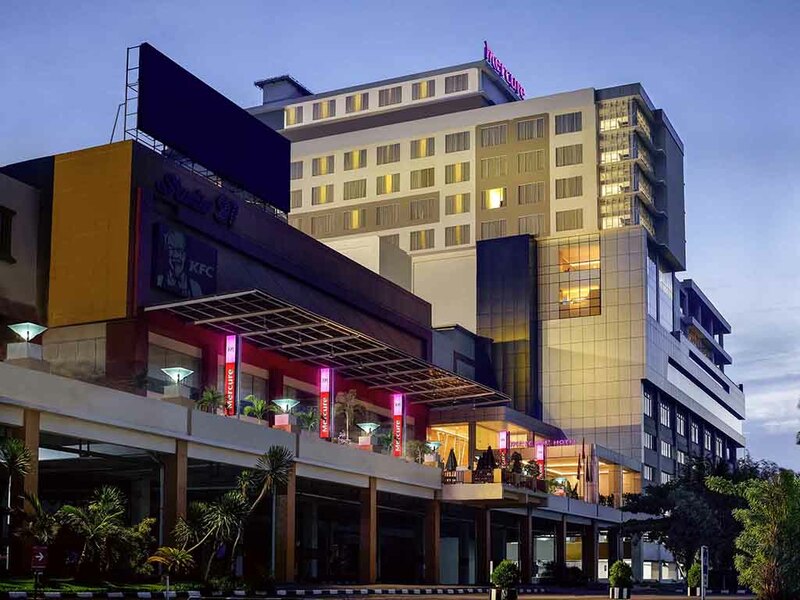 Mercure Banjarmasin has a stunning panoramic view of the surrounding city. The hotel has 2 restaurants, 2 Bars and 1 meeting room with a capacity of up to 300 delegates. All 180 rooms come with a modern and stylish decor. Have a 180 rooms come with a modern and stylish décor. The modern and stylish designed room is spacious and features a minibar, satellite tv, working desk and bathroom with shower. The room also comes with a beautiful city view. Wider range of modern and stylish designed room features a minibar, satellite tv, coffee brewer, working desk and living and dining rooms. The room also comes with a beautiful pool view. A cozy ambiance is designed for your fine pleasure & relaxation, served light meals, sweets & savories including alcoholic and non alcoholic beverages combined with live entertainment in the evening. With large free form pool and tropical garden arrangement, this pool bar is expecting to be favorite corner to enjoy snacks and juices while swimming.